Today the Design Team over on the Digi Doodle Studios Blog is hosting a blog hop in celebration of the new Holiday images! Dina has been busy and wow you should see all the adorable images! Meet the Adorable "Raven"! Halloween cards are one of my favourites to create and I just love "Raven" with all her little friends peeking out! I started by sizing and printing the digital image, and of course used my Copic markers to colour Raven in! 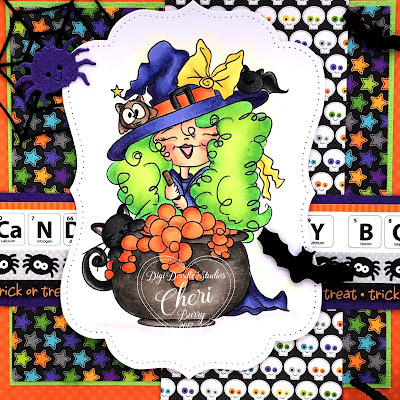 My paper is from the Doodlebug Boos and Brews and October 31st collections. I added a few die cut halloween pieces to compliment the adorable Raven. Some Clear Glitter pen was added to the bubbles, her bow and the orange stripe on her hat. Don't forget to head on over to Digi Doodle Studios and see all the New Holiday Releases! Also hop along with our Designers to see amazing examples of the new images!! This is fabulous Cheri! Love this gorgeous image. Love this card so much Cheri! Only you could make a with look stunning :) FABULOUS!! Ok so you know I meant "witch" right LOL! Silly auto correct!! This is absolutely gorgeous Cheri! I love the colours and her hair looks amazing! Fab papers too! Beautiful card. I love the colors and that beautiful image. 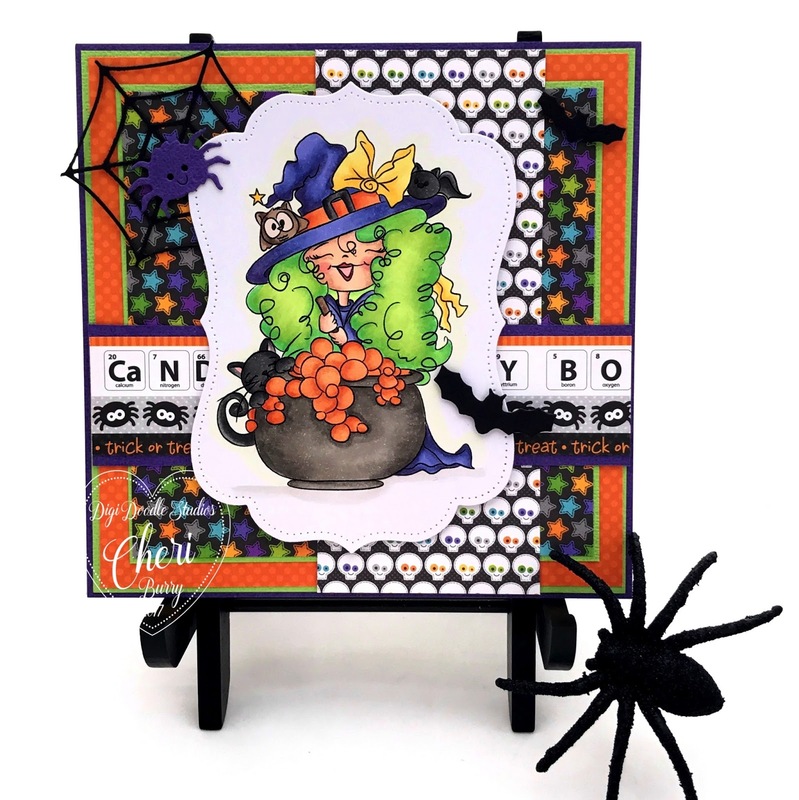 Gorgeous Halloween card. Pretty image and beautiful coloring. Cute image. Love the spider and web in the corner. I love this card. Gorgeous coloring. Great Hair Color! Awesome image.